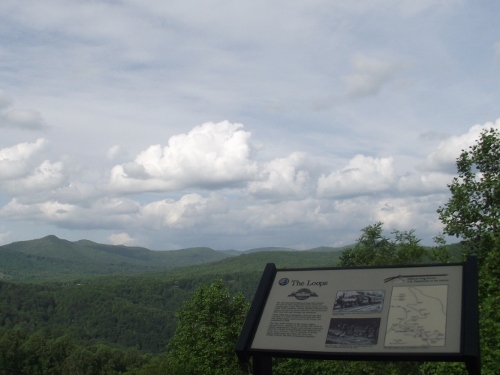 These photos are from The Loops overlook on the Blue Ridge Parkway. Do you get the idea from this blog that I just loved this road trip? If so, you're right. Here's part of why I enjoyed the stop at this overlook. From here you get a stunning view of the Blue Ridge Mountains. These scenic overlooks are on the top reasons why I fell in love with this drive. You can see for miles. Although I couldn't pick it out I'm told that you can see parts of Clinchfield Railroad from this spot. It was completed in 1915 and runs through 18 tunnels on its 32 mile stretch. The mountains that you see are part of the Pisgah National Forest. This covers more than 500,000 acres of Western North Carolina. There are so many hiking opportunities that it's hard to know where to start so I won't. Instead, I'll link to the HikeWNC site. They can tell you where the trailheads are much better than I can. In fact, there's a whole list on the website. If you want to see the Pisgah National Forest looks like at this moment you are in luck. Would you believe that the park service maintains webcams in the forest? I have more photos and information about the Blue Ridge Parkway on the blog. Here's the view of the North Cove.